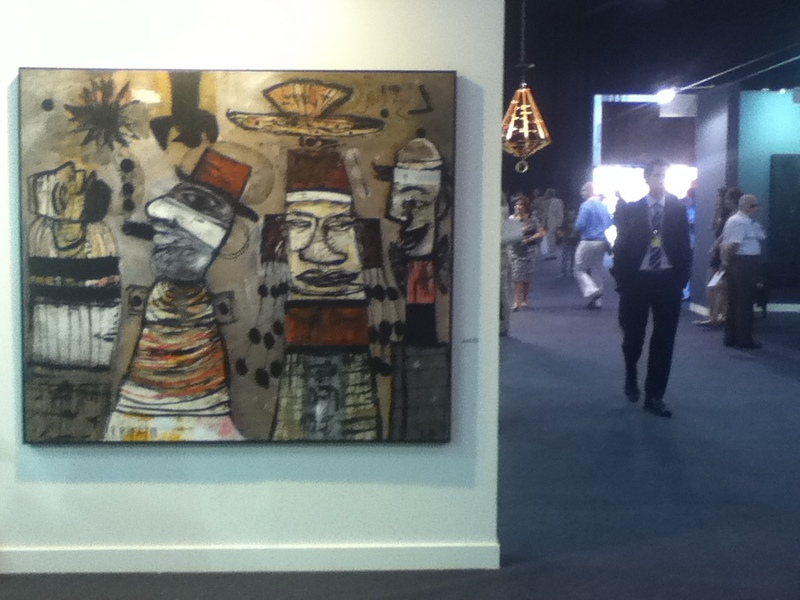 Artwork of Raouf Rifai in Beirut Art Fair 2012 B.I.E.L. As a child I’d shunned the “delights” of the circus, because for a strange, unknown reason the experience brought forth feelings of desolation, sadness and depraved loneliness. It must have implied some unexplained subconscious conditioning that I’ll lay blame for on a tape I had watched in early childhood. 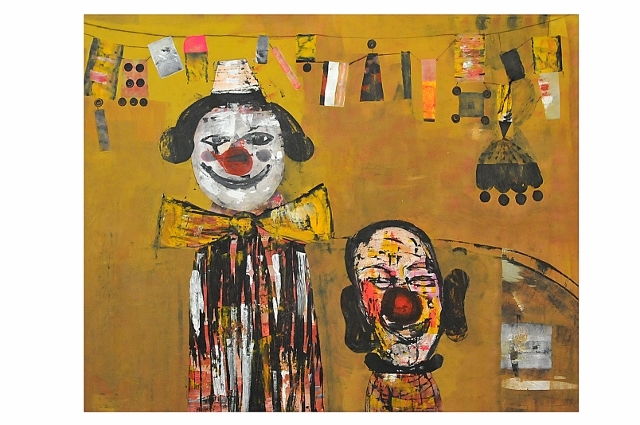 Whatever my personal predicament was with the circus, Raouf Rifai’s solo exhibition “Interlude” at Athr Gallery did more than share my sentimental feelings for the vain form of entertainment. The artist’s statement on the reception wall hardly sufficed the amusing spectacle I was plunged into. The exhibition boasted the razzle-dazzle of a successful farcical evening at the circus – canvases stroked in Popsicle colors of striking reds, oranges and yellows; a smattering of round, cherry noses; a one-eyed patch somewhere; a cage awaiting not the return of the poor gymnastic leopard who earned a thunderous round of applause, but a couple being bound in somber-matrimony; and the absurd juxtaposition of figures awakening the induced trance by the juggler’s act. Stark against the whimsical mood of the circus stood the many “Dervish,” the solitary observers, wise in their perceptions of the world. The nature, gender and identity of the Dervish remained questionable. He is seen transcending the spiritual, ideological and social bracketing of public position. Caught examining with grave poignancy the meaningless performance of the world outside, the Dervish is a metaphor for the ordinary man who in the effort to guard his security and position, builds a private world, feeling protected and secure from the social occurrences that he feels are of no cause and effect to him. But he forgets in his foolish, peasant-like simplicity that he is a pawn, juggled by the venerated and despicable power-clowns, self-promoted heroes, and undeserving celebrities who for better or worse affect his life forever. Paintings like The Wedding Gift and The Emotional Nurse speak at great length about the celebrated ugliness of the mad world and the emotional refuge sought from the melodrama in the public jungle. Some other paintings are caricatures of figures taken from popular oriental culture like the Dervish, Bahloul and Caracoz, who in many instances are found sealed from the trinity of speech, sight and hearing. Rifai, with his keen diligence, has created an ambience of camaraderie, where in reality the crux of the matter is a prodding commentary on the Middle East’s social and political conundrum. His style may not be precise and acute, but he has the ability to give the subjects he paints the power of transience, change and metamorphosis. Interlude signifies the hiccup between two opposite poles on the same end – between what is desired and what is received. The two series together create an ensuing dialogue of wonder and meaning in the stage of life with all the characters of a theatrical performance intact. “Art is the mirror of reality,” Rifai said. C’est le pur senti que Raouf Rifaï écrit dans ses toiles, dédicace pour une société qu’il voudrait absolument impétrante de ses couleurs. Messages ultimes au milieu de la déshérence temporelle, dans des monologues riches d’austérité ! Le peintre est tout à fait conscient des dangers irréversibles de l’homme de la Terre, de plus en plus archaïque et qui n’a plus la possibilité de voir, ni de ressentir, ni même de se retrouver dans ses propres sensibles humains. Homme qui devient pour ainsi dire sous l’énorme enclume de la technologie et de ses propres égoïsmes – bien avant toute chose – et surtout imbriqué dans un vent fuligineux et barbelé. Abjuration du tout humain, les avatars pernicieux… Le peintre, encore une fois, est tout à fait conscient de l’explosion subversive vu qu’il refuse l’autodestruction du sensible. C’est alors qu’il met en scènes ses dernières tentatives, toujours renouvelées. Proposés aux improbables dialogues, les personnages de ses tableaux, ainsi que leurs formes désarticulées, se nourrissent de traditions et de costumes populaires, dans un incessant retour aux vicissitudes, sans lequel le présent n’a aucune raison d’être. Chaque cliché est un départ, ce long chemin balisé et jonché de nopals, de chardons, mais tout en “couleurs” ! ? C’est le cri du cœur dans le pleur du pinceau qui interpelle l’esprit aveugle, afin de recouvrer la vision. Chaque cliché est un nouveau départ, prolégomènes aux interprétations multiples. Le personnage fétiche du peintre est un “darwiche”, nullement une émanation de nature spirituelle soufie. L’étymologie du mot est exhumée ici-même du langage vernaculaire oriental, l’image authentique de l’homme du quotidien, en perpétuelle mutation des saisons de son propre monde… Un “darwiche” toujours esseulé, homme simple de tous les jours, en même temps miroir d’une société contemporaine dérisoire, reflétant les changements géographiques et socio-politiques. Il est placé dans l’univers tragique du grand cirque fugace de la vie. Cependant, ses émanations eschatologiques, dans les cas que l’on espère les plus probables, se veulent une nouvelle humanisation d’un monde, complètement indifférent. Peu de lumière tant les nuages s’amoncellent dans ce travail qui porte – drôle de coïncidence bienheureuse dans « l’art » vénal d’aujourd’hui – tous les éléments de la vie, cohabitant dans des toiles aussi bien expressionnistes que Cobra, en des explosions tragiques ! L’homme est présenté ici dans ses valeurs axiologiques, certes, mais en déréliction, rafistolé et éventré. Des momies macabres, des squelettes malades et en agonie se dévoilent là où l’aube pointe encore une fois ? Dans son expressionnisme le plus virulent, le peintre trace des rayons virtuels de soleils fragiles, dans les non-dits de sa toile. Il y a du ludique chez Raouf Rifaï. Il y a surtout du sensible au bord des syrtes désertes. L’être humain est en premier et dernier lieux, son principal souci, dans des considérations verticales vers l’espace épuré de liberté. It’s a trying life for the Lebanese visual artist. Of course, artists everywhere have never had an easy time of it. Whether they forage for funding, endeavor to exhibit or struggle to find inspiration, their profession is simultaneously one of deeply private creation and necessarily public promotion. The Lebanese art scene is no exception, though the small scale of the local market as well as its uncompetitive spirit may spare artists a life of commercial coups and calculations. But there is the problem of culture. Who is truly interested in Lebanese contemporary art? Can a community of visual artists survive without the presence of serious art collectors? And how may a collective understanding of contemporary art develop without the presence of institutions to memorialize such work? Despite an impoverished cultural climate – not to mention debilitating war and postwar economies – Raouf Rifai has done well. 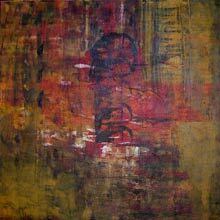 He has exhibited his paintings in France, Japan, Egypt, Syria, Tunisia, Bangladesh and the United States. 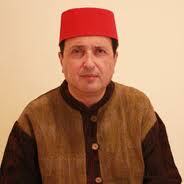 He has steadily shown his work in numerous Lebanese galleries since 1973. His paintings sell at robust prices and please the obligingly critical eye. 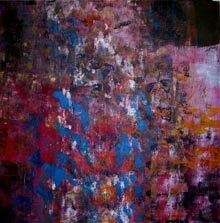 “The artist visibly follows a process of formal simplification and qualification that leads him to create compositions that are, without a doubt, a most compelling mix of figuration and abstraction tending toward the definition of a new visual language,” says the exhibition announcement for Rifai’s current show at the French Cultural Center, on view until December 22. 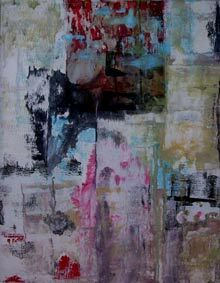 Such long-winded praise elevates Rifai’s colorful compositions to groundbreaking innovations of the medium itself. Although his work does indeed mix figuration and abstraction, there is little in the mid-sized canvases, layered as they are in dense blocks of acrylic color, to indicate that Rifai has developed a new visual language. Complementary color pairs characterize most of the paintings currently on show: bright orange and electric blue, olive green and brick red, mustard yellow and magenta. Accenting tones of white, black, gray and beige serve to detail and outline each block of color. Instead of using brush strokes, Rifai drips and rolls his paint, layering saturated surfaces with grids of wavering lines. What emerges is a visual language between print patterns, abstract landscapes and primitive figuration – neither entirely developed nor notably individualized. Also an urbanist and a staunch environmentalist, Rifai considers his current exhibition to be an expression of spatial vision. 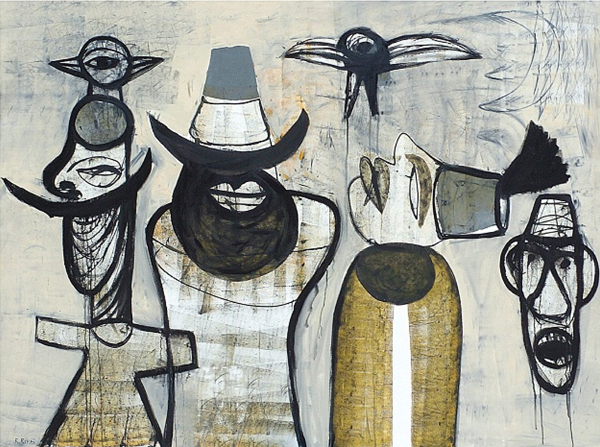 Having previously produced paintings in a more primitive style – depicting stick figures amongst trees in cluttered, childish interiors – Rifai’s move to formal abstraction was propelled to completion by this past summer’s war. “I was affected by pollution – the pollution of the environment and of the city,” says Rifai. Inspired by the urban destruction of Beirut’s southern suburbs and the villages of South Lebanon, Rifai wanted to depict the unexpected beauty of such a deconstructed urban landscape. “This is how my work has developed – more toward abstraction and urban space, and because of the war, I began to see how destruction can inspire. 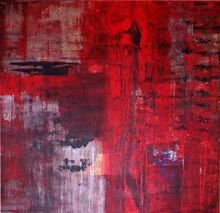 I wanted to paint all of this urban confusion,” he explains. Perhaps he works too quickly. Rifai’s paintings are immediately appealing, like attractive hothouse flowers. But they lack the unsettling detail and raw emotion of more substantially “felt” compositions. In an art scene where a grounding history and an active community have yet to evolve, the question remains: Who is truly interested in Lebanese contemporary art? If Rifai paints by himself and essentially for himself, it is understandable that his paintings may lack conceptual substance. Perhaps he is inspired by the work of some distant masters, as in the colors of painter Mark Rothko and the lines of architect Zaha Hadid, but for whom does he paint? With which local artists does he exchange ideas? What works does he set his own against? Although it may be said that a genius creates beauty under any circumstances, cultural value can only be attributed to work that is validated by a favorable context. Genius or not, art is nothing but private expression until it is recognized and fit into a community of artistic endeavor. 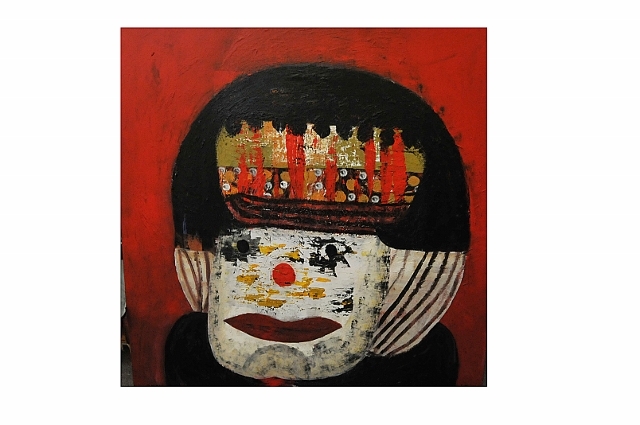 Rifai’s previous work is more firmly anchored in what may be called a Mediterranean tradition. His childish drawings are charming, each one portraying some aspect of a sunny childhood spent amidst the happy disarray of an old-time Lebanon. It may be said that his current work is more “mature.” But according to what standards? Does a move from simple figuration to simple abstraction immediately indicate artistic maturity? And why has Rifai made this move? As there is no cultural context through which Rifai’s move to decorative abstraction may be understood, his paintings remain the results of private whim. It is not so much that Rifai’s colorful urban landscapes are uninteresting, but rather, that they are culturally powerless. BEIRUT: It’s a trying life for the Lebanese visual artist. Of course, artists everywhere have never had an easy time of it. Whether they forage for funding, endeavor to exhibit or struggle to find inspiration, their profession is simultaneously one of deeply private creation and necessarily public promotion. بعد زيارة معرض الفنان التشكيلي اللبناني رؤوف رفاعي في المركز الثقافي الفرنسي في بيروت يخرج المشاهد بانطباع أن الألوان تتمتع بقيعان غير مسبورة بعد، وبميادين لم تطأها ريشة رسام. ففي تلك القاعة التي اعتادت احتضان براعم الفن التشكيلي ووروده المتفتحة، تفرد جدرانها هذه المرة لاستقبال 22 لوحة تجريبية مشاكسة لكل منها مزاجها الخاص وانفعالاتها المجاهرة فهي نابضة وحزينة، واضحة ومتواطئة، هادئة وصاخبة عقلانية وشغوفة. واللافت ان رفاعي أراد لأعماله ان تكون مصوَّبة رغم كل تلك الانفعالات التي حدت ببعضها الى بلوغ درجات عالية من «الهذيان الفني». وهكذا وسط معمعة الألوان وفوضى الخطوط وسطو المعاني المغلفة والمموّهة، نسج رفاعي لنفسه لغة تجريدية تحرص على توظيف تقنية المادة في خدمة الفكرة العامة. ولذلك راح يبعثر المفاهيم اللونية الجاهزة والمبيتة ويقلب مسلماتها رأسا على عقب ويبحث في خزانة المفردات عن جديد يهبه لكل لون ليتلاءم مع موضوعه. وفي دربه هذا، لم يحِدْ عن مادة «الاكريليك» فإذا به يوليها جل اهتمامه، فأخذ يغوص في بياض تلو آخر ويدلف ألوانه فتارة يمزجها لتصبح واحدا، وطورا يتركها على سجيتها لتجف أو يجعلها تنساب كدموع من فوق الى اسفل، ولجأ الى ترجمة مشاعره بوضع طبقات الواحدة فوق الأخرى من دون أن تختفي الطبقة الأولى. فإذا بالاسود يتصادق مع الأبيض من دون طغيان مطلق. ورغم حرصه على ان تندرج كل اعماله في نمط التجريد التجريبي، شكلت كل لوحة من لوحات رفاعي وحدة مستقلة بذاتها، فلا نرى موضوعا مكررا و«لكن يمكن ان تفتح إحدى اللوحات نافذة للتحضير لمعرض مقبل أسلك فيه نسقا معينا»، كما أوضح لـ«الشرق الأوسط». ولم تغب عنه أحداث يوليو (تموز) التي عصفت بلبنان، فقد جسدها في لوحة لم يشأ لها عنوانا فبدت ساحة لجريمة خاطفة كتلك الحرب. فثمة آثار أقدام قاتل وجثة عينها مفقوءة. وإلى جانبها لوحة لـ«أربعة اشخاص» مختلفي الأشكال والألوان والميول، ربما للدلالة على زعماء الطوائف في لبنان. فها هم يقفون على الأرضية نفسها متمسكين بالأرض نفسها إنما يتطلعون الى اهداف مختلفة ولكن مصيرهم يبقى واحدا. وفي لوحة «المحارب»، لم يحصل ذاك الشخص إلا على وسام يعلقه فوق ضماداته ودمه المهدور. وثمة «التوليب السوداء» وفيها تحولت هذه الزهرة سلعة مجردة من أي قيمة جمالية أو معنوية في عصر المصانع والتكنولوجيا. انها واحدة من مجموعة لوحات تركز على أهمية المحافظة على الثروات الطبيعية في بيئة ملوثة. وفي المعرض ثلاث لوحات لـ«بحيرة طابا» في اندونيسيا تسمح للزائر بملاحظة التحولات التي عرفتها تلك البحيرة خصوصا انها تشكلت بعد انفجار بركاني. وهكذا بعد زرقة صافية لمياه هادئة، عودة الى حمرة ثائرة لحمم متدفقة وفيما بعد جثث تطفو على سطح تلك البحيرة بعضها غرق وبعضها جرفه البركان وبعضها الثالث قضت عليه الحرب!